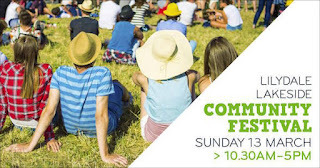 To celebrate the opening of Box Hill Institute Lilydale Lakeside, the Lilydale Lakeside Community Festival will be held on Sunday 13th March 2016. This family-friendly event is FREE to attend and will feature an exciting program of live music, market stalls, children activities and much, much more! Live entertainment from Kate Ceberano and many more! The fun kicks off at 10.30am, so come along on Labour Day long weekend and enjoy this great community event! Don't forget you picnic rug.